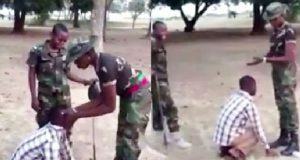 Racism in football may tarry a few more years, so let’s not kid ourselves we can do much right now to arrest it. Deep questions like “Why are there a few black club managers?” and “Why do we have a scanty number of black/African goalkeepers thriving in Europe?” are often asked, but I’m really not privileged with answers. 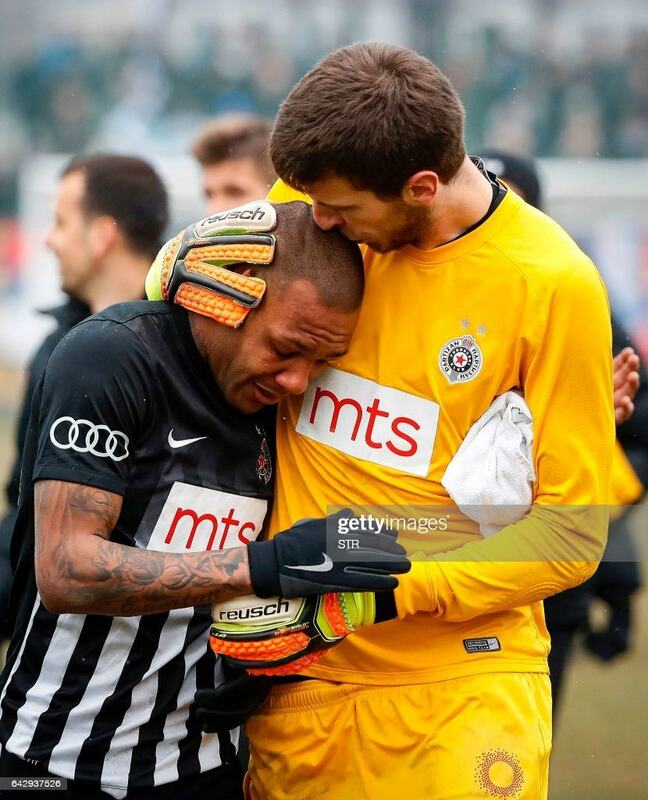 Partizan Belgrade’s goalkeeper Filip Kljajic (R) hugs Brazilian midfielder Everton Luiz as he leaves the field in tears on February 19, 2017, at the end of a Serbian championship match between Partizan and Rad, after racist remarks from Rad’s supporters, Serbian television B92 reported. Racism travels far across Europe. Countries like Italy, Spain and a few others within South America have been major culprits. Football in England, also isn’t as squeaky-clean as it appears to be. Although it’s stale news at this time, how a former England manager Graham Taylor was reportedly asked by the English FA to reduce the number of black players in the English national team, but that remains a huge racial indictment of English football! Black players have grown remarkably, into pretty objects of mockery on the pitch, as obsessed racist fans can’t seem to have enough of them. These racist fans imitate monkey sounds or throw banana peels into the pitch, often when a black footballer of an opposing side handles the ball. I really can imagine how that drives a black player nuts! But regardless, instances of black players crying off the pitch or feeling extremely dejected during moments of racial abuse, quickens a large amount of discomfort in me! Most recently, Everton Ruiz a black Brazilian footballer, wept uncontrollably in the possibly tender arms of his goalkeeper, after racial noises were directed at him. While I sincerely sympathize with Ruiz for suffering such insane humiliation, I strongly criticize his reaction! Soaking your jersey in tears, or reacting in such a way that portrays you as emotionally broken or dejected, makes you reek of inferiority, low self-esteem, discontentment with your skin color and a desperate appeal to be accepted. You simply empower those racists with leverage to hurt black players some more! Famous black footballer Mario Balotelli, had a torrid time during his stint at AC Milan. Part of which were the humiliating monkey chants he endured from the racist fans of his former side Inter Milan, during a game involving both soccer clubs. Given the wild emotional nature of Mario (which many believe, smeared his rise to lofty heights), one would expect him to quit the game, or protest in tears like most black footballers would. 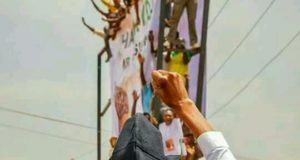 But he kept his composure fully drenched in confidence and pride in his skin color, before placing a commandeering finger on his lips to signal the racist fans to keep quiet! That seemed pretty much to me, a better way of handling racial provocations (until better ways are discovered!). Sometime in 2014, former Barcelona player Dani Alves was targeted by Villarreal fans, who threw a banana at him. Alves picked up the banana, peeled it, took a bite and continued his game! That sure sent a strong message to the racial offenders, projecting his unique confidence and mature mental strength! Black footballers have got to outgrow their cravings for sympathy and accord their skin color a lot more value and respect, especially in the face of racial abuse! Your skin color is black and you owe no apology for that. If some immature racists cannot comprehend that, and choose to throw scornful remarks at you, ignore the losers and carry on with your game. Consistent ignoring of racial stunts from ‘loser-racists’, will kill whatever excitement they derive from racial abuse and eventually make the evil practice boring!